The Many Faces of Copper at the Flandrau Science Center at The University of Arizona is an exciting exhibition showcasing more than 150 natural copper artifacts that hail from Arizona and around the world, including an amazing collection of historic and modern artifacts celebrating copper. Highlights include a stunning copper dress, and an ongoing Miner’s Story Project where visitors can document their copper mining stories in a trailer made of copper. The exhibit kicked off on Feb. 2 at an invitation-only gala with approximately 300 people, including mineral collectors, dealers, mining industry leaders, and members and friends of the museum. It opened to the public on Feb. 3 and will run through May 31, with some works being added to the permanent collection to allow visitors extra opportunities to view this magnificent collection of copper and its byproducts. "For the past several years, the Flandrau Science Center has mounted mineral-based exhibitions that generally open the week before the annual Tucson Gem and Mineral Show," says Rob Vugteveen, Director of Marketing and Outreach. “The mineral show is a four-day event that draws tens of thousands of dealers, rock hounds and mineral enthusiasts from all over the world. 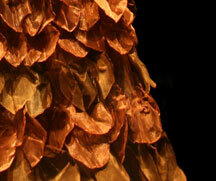 The gala opening of the annual exhibition at Flandrau has become a much-anticipated event. This year, the gala featured a presentation by Richard Graeme on the history and minerals of Bisbee, Arizona, and was attended by a standing-room only crowd "The Many Faces of Copper’s content is primarily beautiful copper mineral specimens (azurite, malachite, cuprite, etc.) along with some historical artifacts of relevance to copper in Arizona. The interpretive panels describe the importance of copper in the history of Arizona from before statehood." The exhibit was a collaborated effort of Shirley Wetmore, Curatorial Specialist with the University of Arizona Mineral Museum, Alexis R. Faust, Executive Director of the Flandrau Science Center, and Shipherd Reed, along with other copper authorities, artists, sponsors and volunteers. 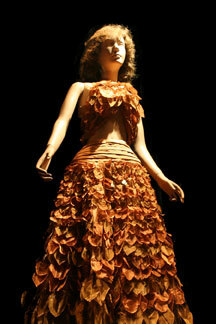 One of the fascinating features in this show is the famous copper fiber gown created in the 1960’s for Tucson Copper Days, by noted designer Cele Peterson, the grand dame of Tucson fashion who opened her first dress shop in 1931. Since then, she has donated her fashions to the Arizona Historical Society, which was founded by the Territorial legislature in 1864 and is Arizona’s oldest cultural institution. It boasts the world’s largest collection of Arizona historical documents, pictures and artifacts, including the copper gown, which was lent to the Flandrau Science Center for this show. According to Faust, The Many Faces of Copper also displays small bronze statues, as every sculpture created from bronze wouldn’t exist without copper. One of these is a bronze statue of Father Kino by Susanne Silver, 1965 (on loan from the Arizona Historical Society) as well as copper bracelets used for healing purposes. Richard Evans, who worked underground as a contract miner for 37 years, and was on mine rescue for 30, created a miniature replica of the San Manuel Mine, north of Tucson, that is also on display, along with a copper Williams-Sonoma Chocolate Pot. The historical significance of copper mining in Arizona is famous throughout the world, thanks to the abundance of copper production. In fact, Arizona leads the nation as the number one mining state due to the largest value of non-fuel mineral production in the country. The minerals from the copper mines of Arizona, specifically the great mines of Bisbee, Tiger, Tombstone, Morenci, Mammoth and Ajo, are the result of the supergene enrichment and hydrothermal alteration of a porphyry copper sulfide intrusion. Although Arizona is well known for copper minerals, those copper mines and other mines in the state have produced ores of silver, lead, molybdenum, tin, manganese, vanadium, uranium, zinc and gold, that are valuable in many ways, but have also become a natural wonder and never-ending source of inspiration to artists who consistently search for eclectic and new exciting ways to create sculptures, paintings and jewelry. The University of Arizona’s Mineral Museum and Science Center work closely together on many exhibits and jointly sponsored the show. In fact, according to Faust, the Tucson Gem and Mineral show is the single, largest event in the world that takes over the whole city. For the past few years, special exhibits have opened just before the mineral show, which attracts so many people that hotels, restaurants, the convention center, Tucson Electric Park, and even parking lots are filled with not only guests, but tents that feature jewelry and gemstone sellers—from beads to emeralds to diamonds to dinosaur bones. This year’s decision to focus on copper was because it was so imperative to Arizona, especially with rising prices. Along with a unique display of copper artifacts and art pieces, The Many Faces of Copper also has an audio element to the exhibition including commentary of real-life experiences in the mines, all recorded within a traveling copper trailer. Pictured above is Shiperd Reed, a documentary film director who collected audio archives for a Miners' Story Project in this traveling copper trailer. “Visitors can listen to segments of several oral histories gathered from underground and surface miners around the Southwest over the past two years by the Miners’ Story Project,” explains Faust. “To orchestrate this project, we hired Shipherd Reed, a graduate of Columbia Film School, who interviews the miners, puts their stories on CDs, which they get to keep and, at the same time, create an oral history archive. This is the largest piece of art on display. This project travels to mining communities in an amazing, shiny copper-covered travel trailer that serves as a recording studio. We can’t go anywhere in the copper trailer without people crowding around it and asking questions. Many of the men and women who contributed their stories told how the West was populated with the quest for copper, gold and silver. We decided to record it because these amazing stories are dying with that generation and we wanted to keep it." The project has even had a series of stories on NPR, KJZZ public radio, in Phoenix and each week they play a different miner’s story that has captivated audiences. And, when the Mineral Museum moves to the new Science Center in downtown Tucson, selected stories and photos will be incorporated into permanent exhibits about the history of mining in the Southwest. "The project not only aims to preserve this important history, but strives to share the history and stories with the public through a variety of outlets," reveals Reed. "The interviews will be compiled into an easily accessible digital oral history archive at the University of Arizona Mineral Museum and some stories will be posted on the project Web site. The copper trailer is a pretty cool trailer that garners a lot of attention; no one has seen anything like it. 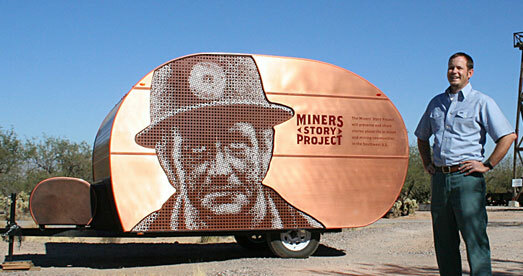 It shines on the outside and one side has a huge image of a miner’s face. Hidden behind the image are speakers, so when we bring it to festivals and fairs, we can broadcast stories or parts of stories from the speakers. The public can listen to the stories as they come through the trailer or stand outside of it. We do allow people to walk inside of it if they want to. It’s actually a mobile recording studio that is filled with recording equipment. The miners—the oldest we had is 98 years old and some of the younger ones are in their 50s—and their families come and do the interviews inside the trailer." Those who would like to share their Arizona copper mining stories or know someone whose experiences should be recorded are encouraged to call and arrange a visit to the copper trailer, to help continue the legacy of Arizona copper mining for generations to come. For more information on The Many Faces of Copper or to arrange to be interviewed, call (520) 621-4227 or visit www.flandrau.org.